This study examined the association between mean daily apparent temperature and hospital admissions for several diseases in nine California counties from May to September, 1999 to 2005. We conducted a time-stratified case-crossover study limited to cases with residential zip codes located within 10 km of a temperature monitor. County-specific estimates were combined, using a random effects meta-analysis. The analyses also considered the effects of ozone and particulate matter (PM2.5). We found that a 10°F increase in mean apparent temperature was associated with a 3.5% [95% confidence interval (CI) 1.5–5.6] increase in ischemic stroke and increases in several other disease-specific outcomes including all respiratory diseases (2.0%, 95% CI 0.7–3.2), pneumonia (3.7%, 95% CI 1.7–3.7), dehydration (10.8%, 95% CI 8.3–13.6), diabetes (3.1%, 95% CI 0.4–5.9), and acute renal failure (7.4%, 95% CI 4.0–10.9). There was little evidence that the temperature effects we found were due to confounding by either PM2.5 or ozone. Our results indicate that increases in ambient temperature have important public health impacts on morbidity. 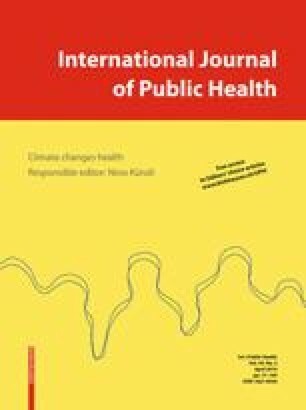 This paper belongs to the special issue “Climate changes health”. The opinions expressed in this article are solely those of the authors and do not represent the policy or position of the State of California or the California Environmental Protection Agency. This work was supported by the California Energy Commission’s Public Interest Energy Research (PIER) Program [grant number 500-99-013].